Pausing, stepping back, changing perspective, and reflecting are all part of an instinct for a mental and physical break that can give you the time, space and insight to make important decisions or life choices. IT’S TOO BAD THAT in the real-time world, everything has reached record levels of FAST— whether it’s food, entertainment, social interactions, news, sports performance, travel or communications. Technology pushes the speed of our conversations, thought processes and decision-making to new levels of “normal” that aren’t normal at all. 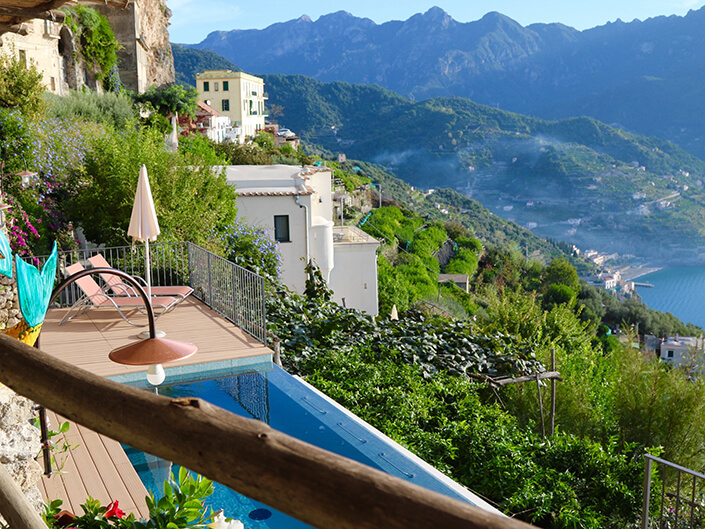 This is why I call my Recipe For Reinvention week-long luxury trip to the Amalfi Coast a RETREAT. The seven nights and seven days are an opportunity to STEP BACK from the stress and pressure of day-to-day life, while STEPPING INTO the food, wine, culture and beauty of one of Europe’s stunning destinations. While we explore, experience and indulge, you’ll disengage from the small external pressures of work, relationships, and home, while engaging in some of the big questions that truly determine the quality of your life. 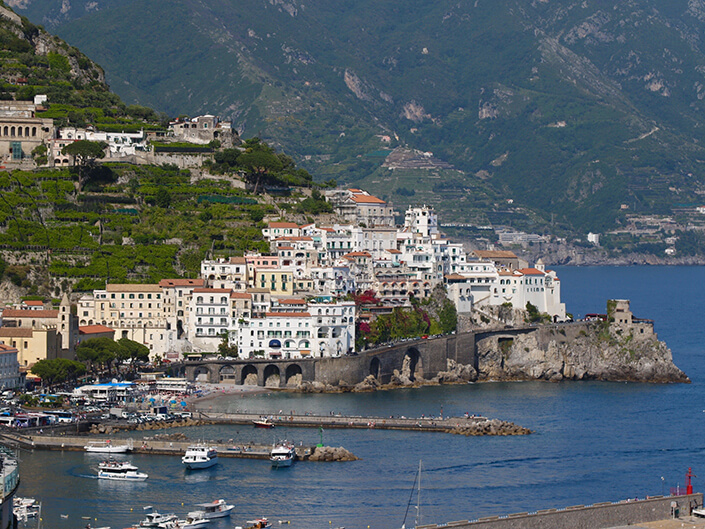 We’ll experience SLOW FOOD while on the Amalfi Coast—feasting on what is real, carefully hand-made, authentic and allowed to express its natural essence. With the Recipe For Reinvention Retreat you will also have a chance to develop a taste for SLOW FOOD FOR THOUGHT, as you are guided to stir up what’s next for you in your life and explore your own authentic flavor. J.S., 35, from Manhattan, came on the trip in 2016 to give herself a long dreamed-of experience in Italy. “I was waiting for the right man to come along to travel with…finally I decided I deserve this now. The fact that it was going to include some soul-searching with other women made it even more appealing. It made travelling alone less scary. I left the week feeling I’d known the women in the group for years.” Having gone through a messy and painful divorce a few years earlier, Jenny had been mostly hiding out, working lots of hours at a job she didn’t love and hardly dating. Signing up for the trip, was her way of saying “I’m ready to start living again, ready to put this marriage and divorce behind me, and give myself permission to live.” We weren’t surprised to hear that she’d met someone and started dating again even before the trip started. Sometimes just the act of committing to something bold, can start things moving in your life. K.W. was in her late 50s, married for over 25 years when she decided to do our R4R Retreat. She loved her life in one of Canada’s most beautiful cities, but was questioning whether she wanted to move forward with her marriage or call it quits because the relationship had become stagnant. “Every day on the trip I just kept saying out loud, ‘this just keeps getting better and better.” The experience exceeded my expectations in so many surprising ways.” The group discussions and exercises gave her the insight she needed to go back home and have the kind of important conversations that could reinvent her marriage or give her the information she needed to let go. C.Z., 42, from Montreal, explored how a safe job she clings to holds her back from making her dream business a success, and developed a plan for her exit. R.L., age 52, from Connecticut, came with an inability to let go of an ex-spouse and left with a clear, liberating experience of moving on. 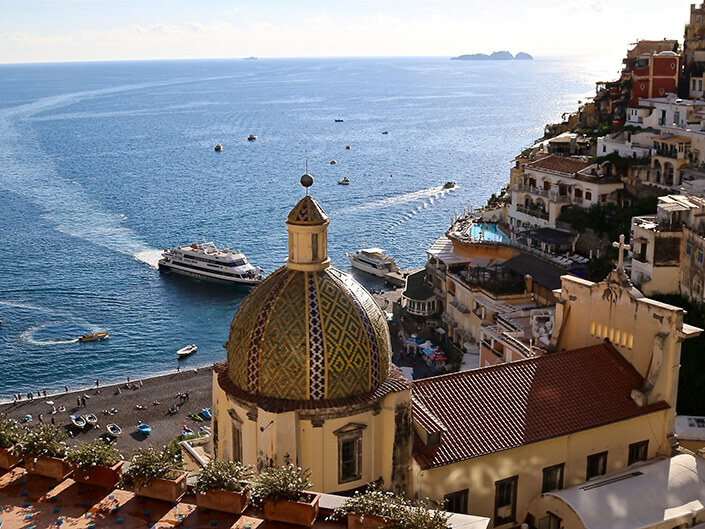 These are just a few of the ways in which powerful women were able to leap forward in their lives by taking a step back and retreating with Recipe For Reinvention on the Amalfi Coast. I hope you’ll join us for the next R4R Retreat in May 2017. Now more than ever, we need to BE THE CHANGE WE WANT TO SEE IN THE WORLD. Reinvention starts with our personal vision of what’s possible, and with Recipe For Reinvention, you will explore what is possible for you. The Recipe For Reinvention Retreat includes everything a luxury culinary tour provides – local culture, dining on the most delicious and fresh cuisine, gazing out over the most stunning natural landscapes in Italy – but adds a depth of authentic flavor that comes not from the places we are visiting, but from a place within YOU! We partner with Delectable Destinations to create the most unique culinary and cultural experiences in the region. Throughout the week, Rachel will be your guide for the “retreat” aspect of this very special journey. She seamlessly integrates experiences designed to allow you to develop your very own Recipe for Reinvention. Exhilarating guided meditations, mind and eye-opening inquiries, meaningful excursions and stimulating conversations that will inspire self-exploration, and help to “stir the pot” that is your life. Whether you get a taste of what it could be like to live a long-forgotten dream, or gather the ingredients for a brand new one, you will come away with real-world ideas and lasting insights for making the rest of your life a delicious expression of who you truly are! This is YOUR time. You deserve a much-needed vacation, but want more than just sight-seeing. You want insight seeing! You long for a transformative experience that will gently support you into the delicious phase of your life that is waiting for you. You will share yourself, your stories, make life-long friends, relax and rejuvenate as you savor the flavors and the moments. Take the leap and don’t look back. It’s your time to “eat, pray and love” yourself! To reserve your spot on the next Recipe For Reinvention Retreat, or to get more information, contact us here. Carol Ketelson is the owner and operator of Delectable Destinations LLC. Dedicated to planning, co-ordinating and curating customized group tours to hand-picked destinations. As an experienced travel planner, Carol’s customized itineraries, specialized tours and off-the-beaten-path experiences create memorable journeys for her small groups of singles, couples, divorced, widowed and solo travelers seeking exceptional trips into the culture and cuisine of destinations around the world. Spring and Fall bookings invite travelers to taste delectable local cuisine, culturally rich traditions and mesmerizing sights. 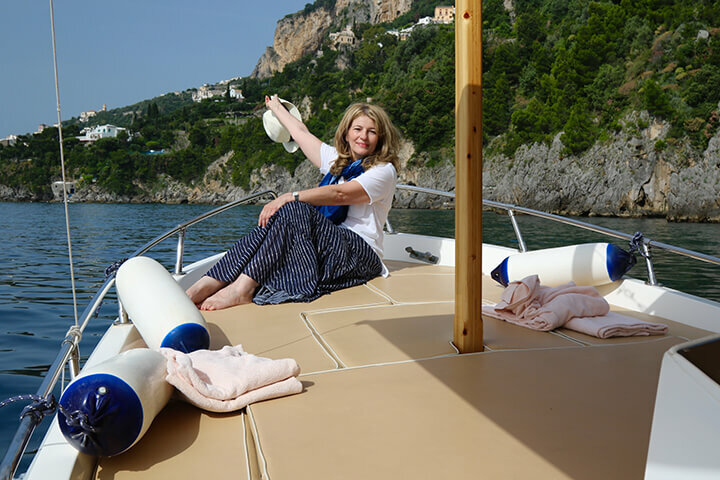 For over 10 years, Carol’s tours have captured the true essence of Tuscany, the Amalfi Coast, Sicily, Puglia, Spain, Ireland and India. 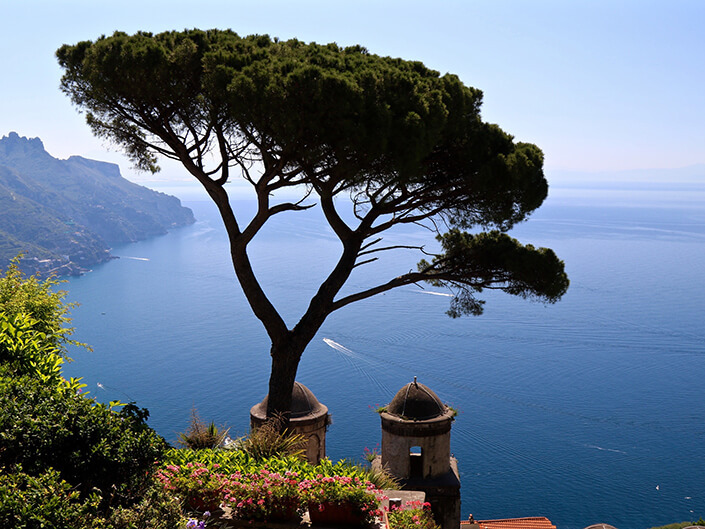 Got Your Sights on an Italian Vacation? Learn How Delectable Destinations Puts the Human Touch Back into Travel Planning. Why Do We Travel for Food?